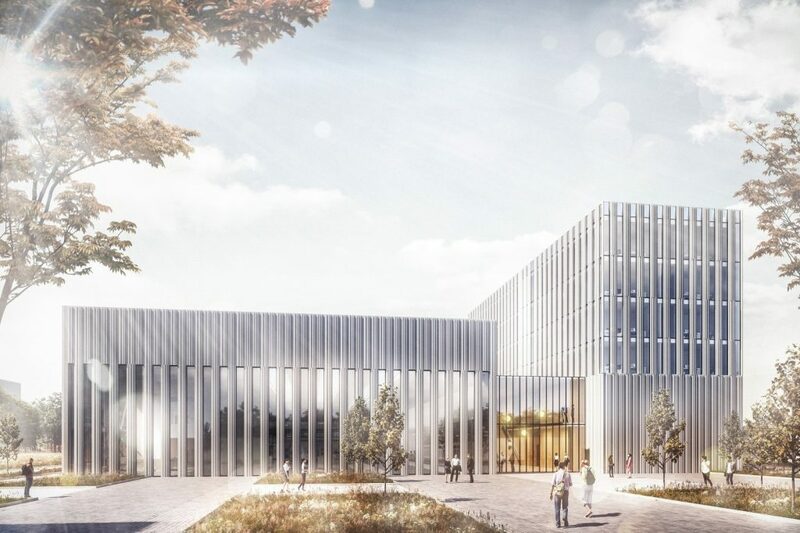 The new Centre for Digitally Networked Production (CdvP) building at RWTH Aachen University provides the interdisciplinary research team with a flexible location responsive to changing requirements. Reflecting its usage, the CDVP is broken down into three discernible sections. The workshop hall and office block form two separate structures, connected by a glazed link. This two-storey atrium interconnects the functions, while its glazed envelope creates a connection to the surrounding campus. The workshop hall combines three process chains and associated storage areas. These rooms are conceived as boxes in the hall that can be adapted to changes in the production processes. The ground floor of the office block contains technical and storage areas. Laboratories are planned on the first floor and floors 2 to 4 are earmarked for office use. A consistent façade design that evokes associations with the highly technical research subjects merges the different building functions into a whole.